While I dabble in many other types of papercrafting/crafting, I am at heart a cardmaker. I think in many ways it has for me the same appeal that creating ATCs (Artist Trading Cards) does. You have a limited blank space--or canvas--upon which to laydown your ideas, thoughts, and designs. Though there are many different sizes and shapes of greeting cards, I tend to work in the A2 (4 1/4" x 5 1/2") size the most. Every card maker has their own set of "patterns" that guides their work. Do you start with the paper choices first? The event or sentiment? The design idea or embellishments? Even though I do have a specific pattern to my card building, many times it is just altered by happenstance. 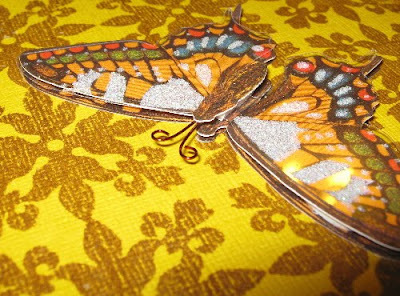 Sometimes it will be finding a terrific piece of decorative paper that inspires an entire card. Other times, it might be a person or place that gets inspiration flowing. Sometimes, I think we tend to be too rigid in our patterns and methods. When you let the card make itself, you can find surprising results. This particular card is an example of that for me. While I LOVE decorative and designer papers as much as the next crafter, sometimes I love to play around with textures and stamps to create my own background images and patterns. What surprised me with this card is the seemingly lack of cohesiveness between all of the elements of the card. What sounded like a wreck in my mind, actually turned out to be an interesting end result (or at least I thought so). To begin, I scored my base cardstock at 4 1/4". I then used a single image stamp to repeatedly stamp the background image over the face of my card. I used a sponge dauber to take the same ink and darken the borders on all edges of the card. Because the paper has a textured finish, the stamping has a raw look to it and the imperfect imprinting adds a certain old-world charm to it. The sentiment is stamped on a punched circle of the Crushed Curry cardstock--and then stamped again with the circular frame border. I layered the circle on a scalloped punch circle of Kraft cardstock that has been sponged with the Soft Suede ink to darken it. Stampin' Dimensionals were used to attach the sentiment to the card. 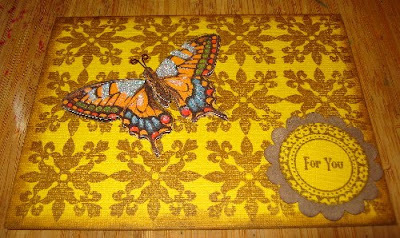 The butterfly embellishment was a weird afterthought that in hindsight is an interesting contrast to the repetitive pattern on the background. 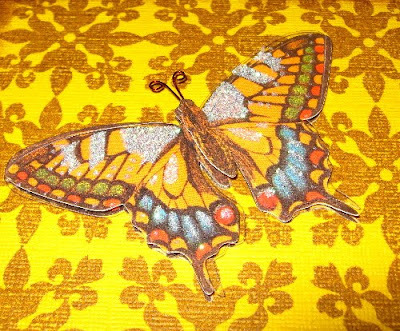 Though it's not clear in the photographs, the die-cut butterfly has a layer of clear transparency film on top of it to which glitter has been applied. 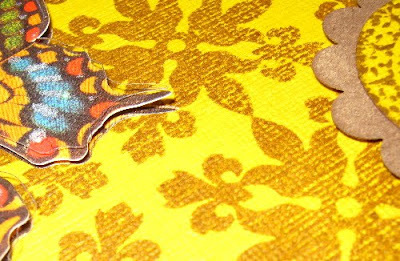 It gives the butterfly a nice sheen and a bit of light reflection which helps it stand out from a busy background pattern. Don't forget that Sunday is the deadline to enter Giveaway #3 (see sidebar for details). May your background always be pleasing and always star in your foreground. Keep crafting! I love it!!! It's beautiful!!! Gorgeous! The background you created is remarkable. 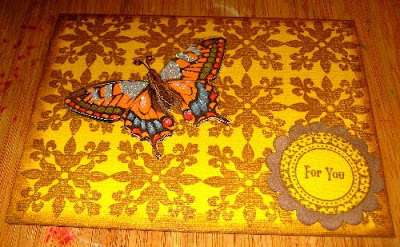 Great card, I love the butterfly. This is beautiful. Love the background. Love the background! I could never stamp a background like that without screwing it up! Looks awesome!